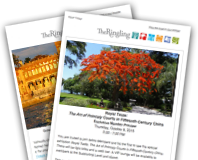 Thank you for visiting The Ringling website. Your privacy is very important to us. Simply stated, our policy is to collect no personal information about you when you visit our website unless you affirmatively choose to make such information available to us. If you choose to share personal information with us — by sending us a message, or filling out an electronic form with personal information — we will use the information only for the purposes you authorized or in support of university sponsored programs. Some of the information may be saved for a designated period of time to comply with Florida's archiving policies, but we will not disclose the information to other third parties or government agencies, unless required to do so by state or federal law or in support of university sponsored programs.